Catching up on WIWs from the past week or so (might have to look back to see what I last posted...) I think I missed photoing one, but it was a repeat that you've seen before. #1 Black and cognac. Not very spring-like, but I thought the combo worked. #2 Poppies and black. Worn to church. I liked it, but the shoes ended up not-so-comfy. worn with earrings in #7. 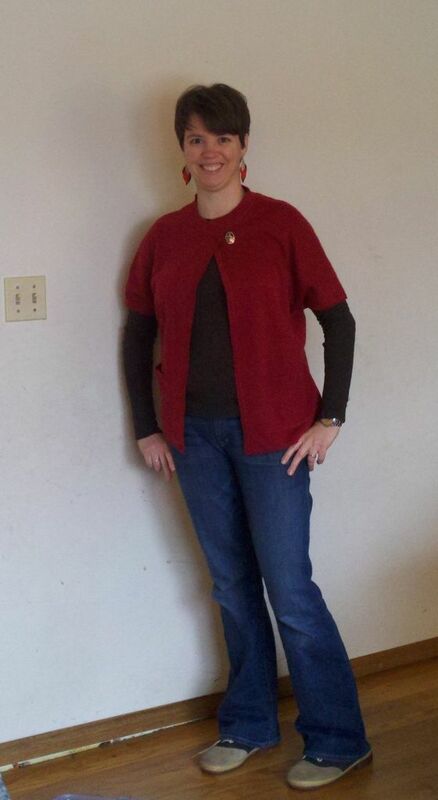 #4 blue jeans with brown crew-neck sweater and big red cardigan. I'm not sure this cardi works - it's strange shape for me. 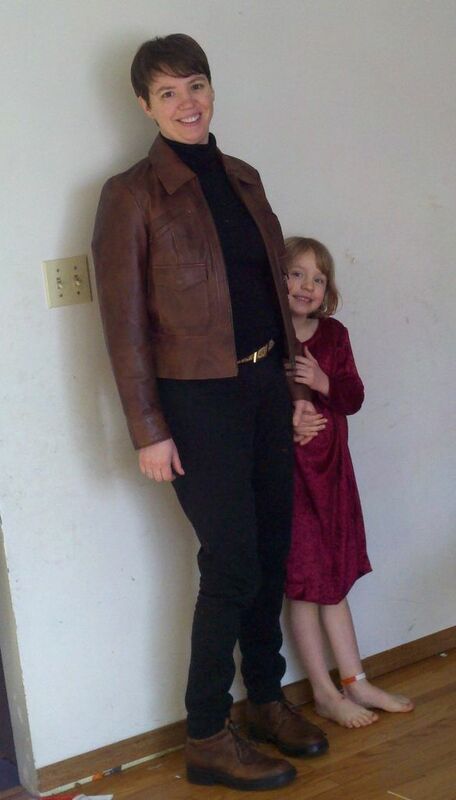 #9, same as #3, without the cardigan (and sleeves unrolled - I wore it like #3 though). My girls decided on Saturday that my wearing just my silver-toned studs in my ears all the time was boring, and I needed to wear my earrings. So I challenged them to pick out earrings for me to wear each day and I would wear them. 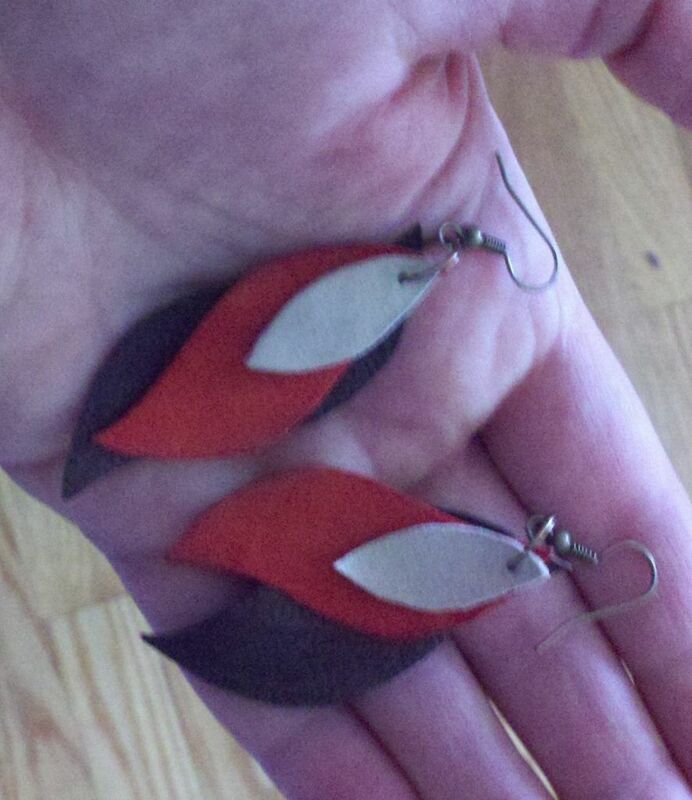 Saturday they picked out the leather "feather" earrings in #7, and I wore them with outfit #4. Sunday, they picked out #6 for St. Patrick's day, and I wore them with #2, and this morning, they picked out #8, and I'm wearing them with #3. 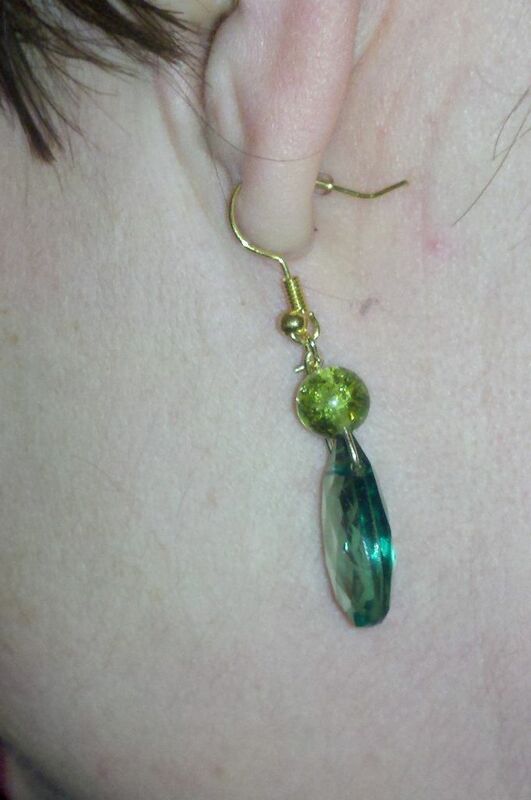 #6-#8 homemade earrings, chosen for me to wear by my daughters. Please leave suggestions and feedback. I love learning what works and doesn't! The green jeans are cute! The white ones look great also! Great set out of outfits. Wow, I love them all. I think #3 is my favorite--bold, playful and stylish. Ylf! love the color play in all the outfits. very fab.The simplicity of # 9 has my heart though! Fun outfits! I think they all look great as-is, except for #4 which I would like to see with either pointier and/or slightly heeled shoes/boots (the flat+round-toed shoes give this outfit some extra frump to my eye). I think you'll find those green jeans surprisingly versatile, I wear mine all the time in spring/summer especially! An excellent week, Amy! LOVING (and that's a Diva shout) the cognac jacket with the black. So down to earth and elegant at the same time. The poppy look is fresh and polished and perfect for the church. The next look is wonderful. Actually, they are all fab! What about trying the red cardi with skinnies. I think that proportion might work better. Love 1,2 and 5. I really think these are some of your best WiWs I have seen! Cruddy weather, but you look terrific! #3 and #5 are KILLER. You best ever! Your girls did a wonderful job picking out earrings! All look fab to me, especially #1,3, and 5. Love your green jeans! These look great! I especially love # 1 and 3. This is absolutely your best set of outfits ever. Really adore #1,3 and 5. That leather jacket pulls the outfits together beautifully, giving a luxe look. 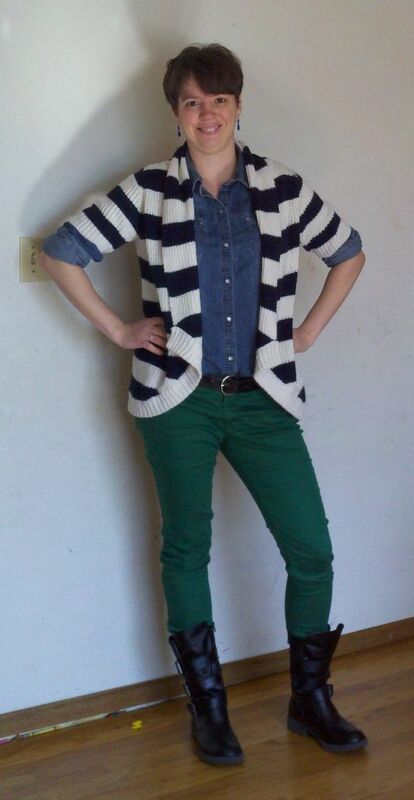 And the striped sweater is so fun with the green jeans. Just fabulous! I agree with Angie (now that's some news... :o) that 3 and 5 are outstanding. You have such a gentle smile and best of all - your kids are adorable. All these outfits are great! You are really starting to get a feel for your style, proportions and what looks good on you. OMG! Something has happened here when I looked away from the forum for a second. You are looking so fab in these outfits. I love 1, 3 and 9 especially. I'm amazed at your fast progress. You're leaving us in the dust Amiable! I love #3! Those green jeans look excellent on you! These all look fab! Your girls chose great earrings. I love 1 and 3 the most. I think you are looking great in these. The only one which has me doubting a bit is 4, it probably is the shoes as Aida said. 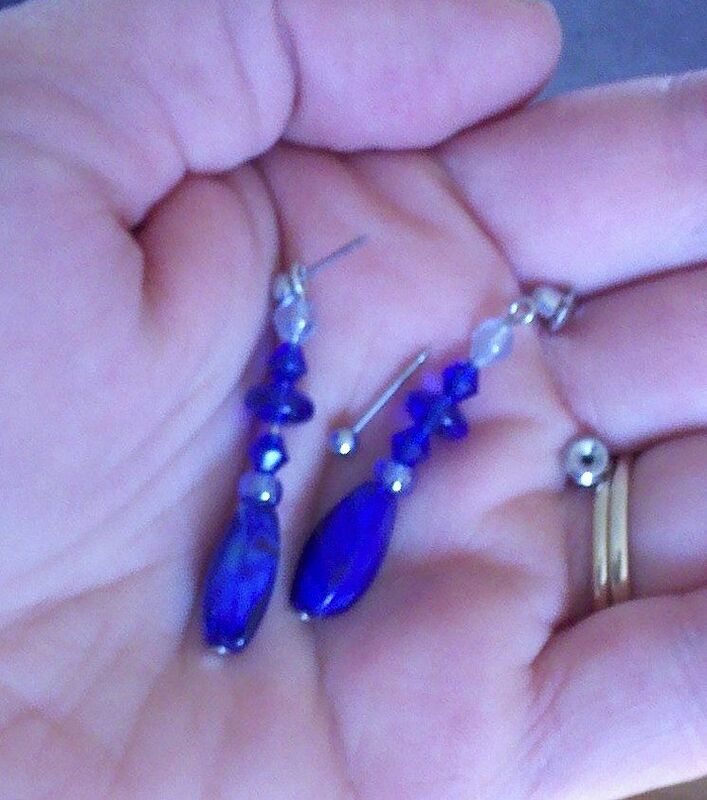 What lovely hand crafted earrings, most impressive!